We are happy to announce a contest for the best customer project! Just send in a project that uses our designs. There are no limitations - the project can be anything: framed embroideries, clothing, quilts, tableware etc. 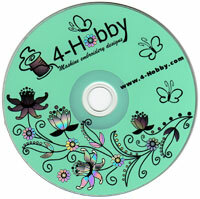 In order to participate, you should send in photos of the project by e-mail to contest@4-hobby.com. When it will be started? Now! Send us your project now and wait for our confirmation (if confirmation not received during 24 hours, please resend us your project). If your entry is accepted, you'll receive gift coupon for $10 for the next purchase in our store. Any person who like your project may vote. How will be winners selected? Winners of the major prizes will be selected by voting. The project with the most votes will get the Grand Prize, the project with the second-most votes will get the 2nd Prize and the project with the third-most votes will get the 3rd Prize. Voting will start on November 23th, 2014 and end on December 20, 2014. The winners will be announced on December 22, 2014. At least half of the designs used in your project must be chosen from the designs available on our website. Any image format and any size are acceptable. Please include your name, e-mail and the type of machine you use. Also include a brief description of the project you submitted. Entries should be sent in by 12:00 PM PST on November 21, 2014.